Young man, there's no need to feel down. I said, young man, pick yourself up off the ground. Sometimes kids get down. Especially when they are new in town. You try to tell them that there is no need to be unhappy. That there is a place they can go. Even when they are short on dough. They can hang out there, and find many ways to have a good time. Gosh, who didn’t love disco? Okay, well most of the people now a days might say that disco wasn’t that great. But you know they would have been boogie-ing it up at the disco in their hometown if they could. Heck, they still sing out loud when they hear "Once I was a boggie singer, playin' in a rock and roll band...Play that funky music White Boy." When your son comes home saying he is feeling a little down, just say "Young man, cause' you are new in town. That's no reason to be unhappy," and give him this Child 70s Disco Fever Costume. He will make lots of friends, because he will be the grooviest kid in all of school. He will be boogie-ing down the hallways to "We are family, all my sisters and me." 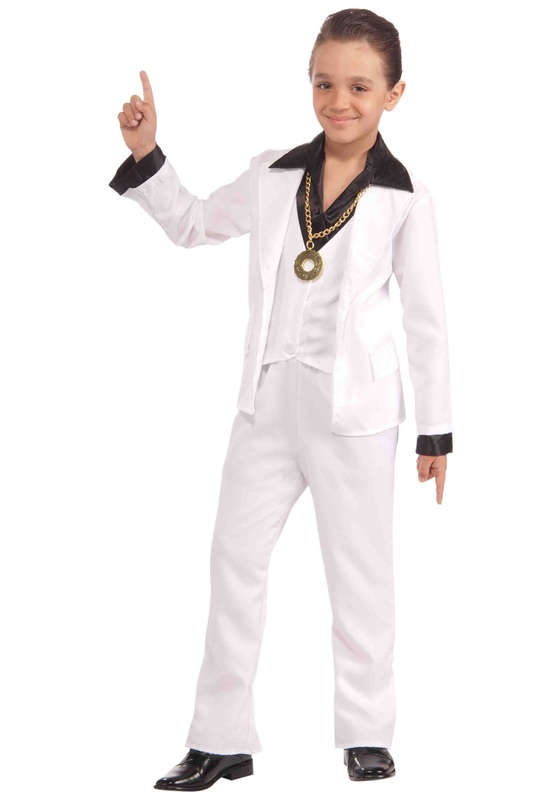 All the kids in his school will want to be friends with your white disco suit wearing son. Him, and his new friends can go down to the Y.M.C.A. to hang out, and practice their dancing skills. The vest, shirt and coat are all attached and didn't work for us. It also ran a little small.